A Happy Visit. How old should my child be for their first visit? Fear is a result of the unknown and we want your child to feel as comfortable and confident as possible about their dental check ups. We recommend bringing your child in for a “happy visit” as early as three. A few minutes in our chair every 6-12 months can lead to good habits for life! Your child’s first visit will last about one hour. 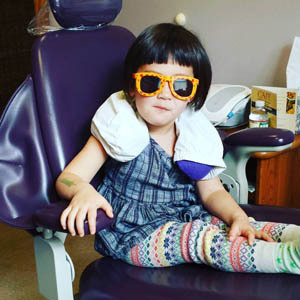 We will clean your child’s teeth and take any necessary dental x-rays (low dose x-rays). We will also do a full examination of your child’s teeth to assess his or her oral health. We like you to be in the exam room for the first visit in order to participate in the assessment and planning of your child’s dental care. In future visits, after trust and confidence has been established, we have find that if the parents remain in the reception area, it allows your child to start developing positive dental experiences on his or her own. It is important for you to know that we emphasize a gentle approach to treatment. We do not use restraint.